(Lee’s Summit, MO) – Summit Christian Academy (SCA) recently celebrated International Education Week (IEW) for the 8th year in a row. International Education Week is part of SCA’s commitment to building a global community throughout the school. During IEW, K-12 students engage in educational opportunities including games, presentations, and cuisine from across the globe. 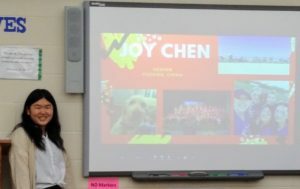 SCA’s 23 international students from China, South Korea, Brazil, France, Russia, and Peru shared their home countries and culture with fellow SCA students by giving topical presentations to both secondary and elementary classes. SCA Senior Jiayi (Joy) Chen from Fuzhou, China shares with SCA Secondary students about her home country.